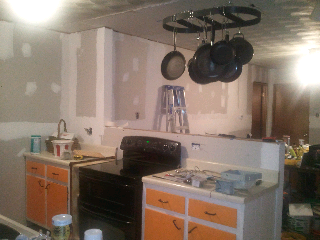 Always Think Bigger: Kitchen's comin along! In the last 10 days our kitchen has really been transformed! Geoff went to home depot & got the double oven of his dreams and then to bed, bath & beyond for our pot rack. Obviously, we need paint. But overall the look and feel of the two rooms has really changed! We really love the half wall where we used to have a full wall and built in desk on the other side. Being able to see all the way like that really makes both rooms feel bigger. The cookie sheet caddie next to the stove & the microwave caddie in place of the dishwasher may truly be 2 of the best things we have done to the space! 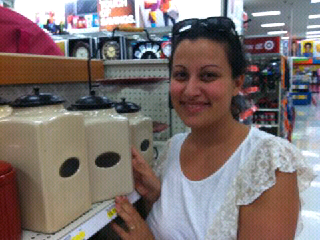 For decorating and storage, I would really love to get ceramic cannisters from target! But honestly, I just can't wait to be done!